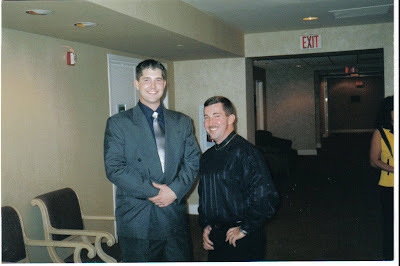 I was looking through some old photos and found this pic of me and my buddy Eric. I knew he was a big guy but didn't realize how big until I saw him in this pic. We worked together in the Navy, about 9 years ago, while stationed Naval Amphibious Base Coronado, California. I don't remember the occasion (probably a Christmas party for work). Check it out, I was sportin' a mustache and had 18" guns in those days. I love finding old pictures of me and my friends!! It always brings back fond memories! And that guys is tall! He looks as tall as the door! Always great to have pics of old friends...my hubby and I just reconnected with a dear couple from 27 years ago!!!! Although we had lost track of each other after all this time...when we talked on the phone, it was like no time had passed! What a big guy! Are you still in contact with him? Thanks for sharing this. Don't you love finding old photos? Your friend looks like he could be a basketball player. He's so tall! Dropping by from follow friday john, added this blog to my site already. Happy Friday Follow - Rita @ One 2 Try. Please visit our Sponsor. Wow! He is tall! I am really tall and I can tell he's tall-tall. Too funny. Happy Friday Follow! I am your newest fan! THanks for stopping by.. I am so glad you did! May I get lost in the deep blue waters..?? Love your 'boat'! What a fantastic stomping ground you have here!! Great blog! Cute kids!!! I keep trying to get my husband to blog. . . maybe one day! Thanks for stopping by my blog. . . I'm following you back! Thanks for visiting my blog! Nice to "meet" you. Sounds like you have a pretty amazing wife and you have adorable kiddos! And yes, finding old photos can bring back some great memories. Not just what was happening in the photo but the memories of life that took place around that time. SO FUN! Thanks for stopping by from Friday Follow. Thanks for the Friday Follow. Following you back. Have a great weekend.